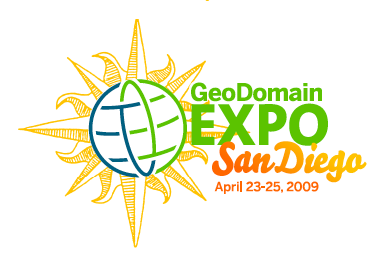 Now that I am committed to attending the GeoDomain Expo in San Diego next month, I want to make a few suggestions about what I’d like to see on the agenda to get the most out of the conference. There are many changes that have taken place in the geodomain business, and I think this is going to be an important conference. There are a lot of successful websites doing a variety of things, and I think it will be great to hear about the various tactics that are working and aren’t working. – Socia Media – How are some of the biggest brands integrating social media tools into their websites? Are sites using discussion forums, Twitter/Digg/Facebook/StumbleUpon icons, comment submission, and/or other tactics? Are their particular companies that geodomain websites can work with cost effectively (such as Pluck)? – Newpaper Model – Although most geodomains are used for tourism, have any small businesses jumped into the newspaper/media industry to provide relevant news content? Do they use content writers, professional journalists, amateur writers who are readers, or syndicated content? – Fresh Content – How are geodomain owners keeping their websites updated regularly with relevant content? Who is responsible for creating and adding the content? – Ad Sales – For non-local geodomain owners, how are advertising sales made locally? What strategies are working and what aren’t working? What is the key to advertising sales if you don’t live in the area? – Search Engine Strategies – Google/Yahoo can be the key to a site’s thriving or failure. What is the best way to get rankings for your primary city keywords, site links, and long tail keyword results – and ensure that they are kept? Are there good link exchange strategies that I can employ? – Event sponsorships & Memberships – Where should the geodomain owner spend funds in the local community? Should the geodomain sponsor sporting events, cultural activities, or make contributions to local charities? Is the local Chamber of Commerce or the Rotary Club a necessary membership? How about others? What else have I missed that should be discussed? Great ideas Elliott. All topics every geodomain owner would benefit from getting more insight into. @Ron – I hope you change your mind and come to the show. I e-mailed them and wanted to know the agenda prior to me going? I live in San Diego and it’s convenient but this needs to be worth my money like DomainFest was. I hope they take your suggestions Elliott. Believe me, Jim, it will be worth your money. The agenda will be posted soon. Could Associated Cities indicate what the recent issues were about, to the extent they reflect on its mission/goals, for us current non-members? Elliot, your suggestions are excellent ones and well in line with the thinking that is going into planning the expo. These bullet points are among the topics slated to be incorporated into the sessions. Are there concurrent sessions or is it one at a time? An auction this time around? If so, who’ll be running it? One thing we should discuss is whether newspapers abandoning print for online is a good thing for geodomains. My inclination is yes – despite the competition. A newspaper driving people to the web will be good for the local geodomains. ditto to what Jim said. @Elliot – Now that the uncertainty surrounding the show has been settled I am going to rebook my flights and go to San Diego. When I cancelled and said I would not rebook I didn’t feel I could have confidence that the show would go or that if it did, it would have the full attention of the organizers needed to insure another great show. The past few days I have seen my friends in the geodomain community and at Associated Cities pour themselves into the effort and I am now certain they will make being their worthwhile for every attendee, just as they have done in the past. In fact, I get the feeling they feel they have something to prove this time out and it could end up being the best one ever as a result of that. They sure have the right location for it and with Mark Burgess at SanDiego.com serving as the host member from AC, I know everyone will receive a great welcome. Looking forward to seeing you again there and I hope the domain community turns out in force. The GeoDomain Expo delivers great value for the money and the people you will meet are certainly among the smartest, most accomplished people in this business – among the friendliest too, so if you are looking for advice with a smile from good people who know what it takes to build successful websites, San Diego is the place to be. The dates are very convenient for anyone going to T.R.A.F.F.I.C. Silicon Valley too. The GeoDomain Expo ends Saturday, then you can take a cheap non-stop flight up to San Jose Sunday (that leg cost me just $79 on Southwest) and be there when the doors open at T.RA.F.F.I.C. in Santa Clara on Monday. Question, will the geodomain event only feature .com geo names? I ask as the home page states that it is for destination/geo specific .com names. Although this would be just a ategory of geo names, is there willingness to explore other cctlds, .info, .asia, .travel?? If you are worried about missing a session, bring a second member of your team and attend both!